Typically made with a broth, vegetables, and a variation of herbs and spices, soup has numerous benefits. It’s good when you don’t want a meal that’s too heavy, it’s perfect for when you’re feeling a bit under the weather, the list goes on. It comes in all kinds of varieties, making it suitable for all kinds of occasions. From a classic cup of Rhode Island clam chowder to a substantial bowl of chili, find your favorite at these soup places in the Ocean State. The folks at Olga’s are in love with food and people according to their website, and it certainly shows through their soups and sandwiches. This artisan bakery and cafe offers a seasonal menu featuring breakfast and lunch served in a small cottage with a garden patio. Everything on the menu, from soups to sandwiches, is based on what is fresh and in-season, and the soup is always de jour, freshly made, and delicious, according to reviewers. Chef owned and operated, Turtle Soup specializes in traditional American cuisine with a modern twist. The restaurant itself is located on the seaside and features an outside bar and lawn seating with ocean views. Ingredients are fresh (never frozen) and local whenever possible, and, as far as soup goes, there is always a hearty New England clam chowder on the back burner, as nature intended. Hons specializes in Chinese and Vietnamese cuisine and runs their shop out of an unassuming brick building. Their menu features some killer soup and rich dishes cooked up right on the premises. From their all but famous chicken sweet corn soup to their oriental beef stew noodle soup, if soup is your thing, then stop soon or order online. Although people talk about the chicken fried rice and pineapple fried rice here, their soups are also amazing. That is because fresh ingredients are the difference, say owners Bob and Mollie Silakone. But don’t take their words for it, as their homemade pho soups come in either meatball or seafood with a squeeze of fresh Kaffir lime and lemongrass for a difference you can taste. Established in 1995, Macera’s is chef-owned and operated, and it specializes in traditional Italian fare & pizzas that are cooked to order. People rave about the soups here, and with good reason. The chicken escarole soup is second to none and it is loved by many. Moreover, the Chef’s Special soups change daily and are also very popular. At Luk Thai, there is one thing Chef Pele Rittipa knows how to do: cook amazing Thai food. The menu is comprehensive, offering well-known dishes like curries and Pad Thai. Plus, the chicken ginger soup is one of their best sellers, as it utilizes tons of fresh lemongrass and ginger. At this strip mall favorite, you will find Szechwan, Mandarin, Cantonese, and Shanghai Chinese plates, plus sushi, tiki cocktails, and, by many accounts, some of the best soups in town. The food is always fresh-cooked to order, and the soups are plentiful, including miso, egg drop, wonton, hot & sour, vegetable bean curd, chicken and corn, and the daily house special. Sun & Moon has been serving up authentic Korean cuisine since 2002 when Chef Lee saw an opportunity to fill the need for traditional Korean food in the local community. Specifically, the soups here are like nothing else you can get in the entire Ocean State, and there are far too many to list here (13 offerings in all). However, you can start thinking about Korean bean paste soup, kimchi stew, and oxtail soup and you’ll be well on your way to imaging the menu. This Asian noodle house specializes in soups, noodle dishes, and clay pot offerings, and all of their soups are fully customizable. However, you can still order off from a pre-scripted menu featuring pho beef noodle soup or a veggie soup called Tom Yam. Alternatively, you could build your own soup offering, starting with the noodle, followed by the protein, and, finally, adding in your selection of broth. Established in 2005, Minh Hai specializes in traditional Vietnamese dishes that are fresh, healthy, and delicious. Daily menu specials supplement a menu full of rice and noodle dishes. 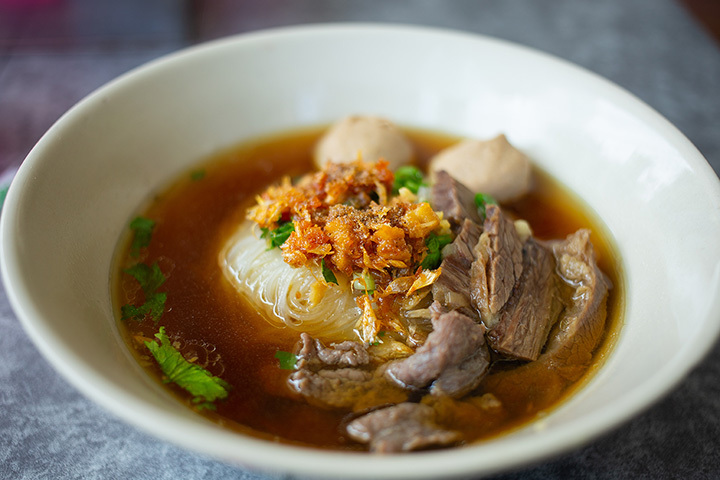 Plus, there are over 13 soups on the menu, including pho beef noodle soups, seafood noodle soup, and Canh Chua, a spicy hot and sour lemongrass soup.